Gabriel Portuondo and Erika Iverson in Calderón's Two Dreams—Life is a Dream (1635). Photo by Theo Coté. BOTTOM LINE: Two Dreams is a theatre scholar's rare treat; while well-executed, it's a marathon nonetheless. Calderón's Two Dreams is two weighty historical plays packaged as one. Spanish playwright Pedro Calderón de la Barca first wrote his play Life Is A Dream in 1635, and completely rewrote it again in 1677, apart from a few re-used themes and moments of dialogue. The 1635 version began to catch modern critical attention in the 1970s, and has been a theatre history staple since. The later version, however, is a bit difficult to find or even find mentioned. If it's uncommon to see the 1635 version staged, it's downright rare to see the later version performed in its own right. Perhaps there's a good reason why we don't see these plays programmed very often, considering the challenge they present to American theatre producers. 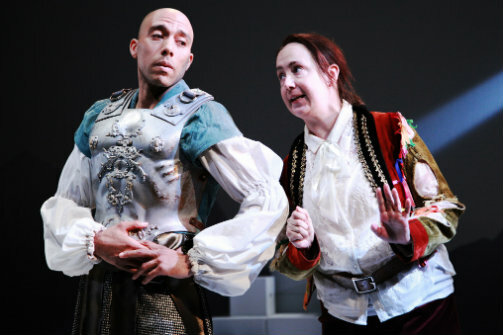 The first challenge is translating Calderón's 17th-century Spanish into compelling modern English, which Magis Theatre opted to attempt themselves. George Drance, Alvedo Galván, and the Magis company achieved fun, bouncy translations of the works which all the actors performed very well. Some performers have greater opportunity than others to turn this excellent delivery and direction into compelling scene work. Gabriel Portuondo (Clotaldo) and Ashley Setzler (Rosaura) sync well in the first play as actors, but they also subtly rhythmically sync the flow of their dialogue with the production's careful sound and music design—when it works, it is a real treat. Their stage chemistry and the rest of the cast's solid performances balance Erika Iverson (Horn)'s solo foolery and Gilbert Molina's (Segismundo) greater strength as a monologist. In the 1677 play, Danielle Delgado (Shadow) and Ali Kennedy Scott (Prince of Darkness) bend into the fun of playing Team Evil in a Mystery play, balancing the lofty unemotionality of three large puppet-headed symbolic figures, Wisdom (Leslie Lewis), Love (Ashley Setzler), and Power (Dennis Vargas). The next challenge is incorporating design elements that work in harmony with the text and the implied performance conditions of Habsburg Spain, all while speaking to a modern audience. Costume designer Siena Zoe Miller and her assistants Elizabeth Wilson, Kate He, and Gianna Meaglia are to be congratulated on costuming in particular: the functional, gorgeous costumes help clarify and strengthen the obscurities of 1635's plot, and are at the core of the 1677 version's comprehensibility (in combination with Ashley Setzler and Jane Catherine Shaw's stunning puppets). Lighting is a bit uneven throughout, although since it seemed like lighting environments always changed a bit early or late, perhaps it was a technical issue.Shikego Suga's heavy choreography of both pieces, especially in the 1677 version, is a delight. The music that underpins every moment lends emotional pull to even the dramatically clunky moments without being obtrusive. Other elements of the 1635 and 1677 plays must be taken separately as strengths and weaknesses of the very different works themselves. The 1635 play has been called Spain's Hamlet, while the second is a mystery play adaptation by the same playwright after he left court to become a priest. They present structurally similar stories in the sense that each protagonist commits an act of hubris and must be redeemed by an act of sacrifice. The 1635 Life Is A Dream has a narrative, familiar structure similar to Shakespeare (a near-contemporary), with a plot and minor subplots featuring familiar archetypes like the fool or the woman in disguise as a man. Once you get your head around the plot, the message of the work is morally opaque to the point of ambivalence. Perhaps more than Spain's Hamlet, it is Spain's Macbeth or a courtly Fuenteovejuna, with its cautious questioning of how men seize power, and then keep or lose it by their own choices at the end of Spain's Golden Age. The second play is a mystery play, less accessible to a modern theatre aesthetic. It reads more now as "symbolist Godspell" than anything else, however well-performed. The first part of Magis Theatre Company's mission is to "offer theatre professionals, students, and teachers a comprehensive, regularly scheduled technical work-out." I'd extend that to the audience as well: after three hours of such difficult material, it felt like it was time to grab a towel and hit the showers. Still, the production is very well-executed, and the company is to be congratulated for the attempt. Calderón's Two Dreams was written by Pedro Calderón de la Barca. Translated by George Drance, Alvedo Galván, and Magis Theatre Company. Directed by George Drance and Kelly Johnston. Composed by Elizabeth Swados. Producing director is John Breen. Choreographed by Shikego Suga. Set design by Caitlyn Murphy. Lighting design by Alex De Nevers. Costume Design by Siena Zoe Allen. Puppet design by Ashley Setzler and Jane Catherine Shaw. Poster design by Luba Lukova. Music Direction and Arrangement by Uri Frazier. Music by “Almost an Orchestra”: Christine Arboleda, Stephen Cruzado, Uri Frazier, Jeonghun Arron Kim. Stage managed by Hannah Alikhani and Stephanie Kay Garcia. Costume assistants are Elizabeth Wilson, Kate He, and Geanna Meaglia. Follow spot by Liam Armstrong and Piotr Gawelko. The cast is Danielle Delgado, Margi Sharp Douglas, Erika Iverson, Leslie Lewis, Joe McGranaghan, Tsebiyah Mishael, Gilbert Molina, Gabriel Portuondo, Rachel Murdy, Ali Kennedy Scott, Dan Solomon, Ashley Setzler, Dennis Vargas.